Sweet juicy raspberries are so good! They grow abundantly in my garden – every day for the last month, a joyful part of my daily schedule was picking these red ripe treasures. Raspberries are a member of the rose family. Some cultures consider the raspberry to be love-inducing. They are not just red: there are also black, purple and gold raspberries. The average raspberry has 100 to 120 seeds. Unripe raspberries do not ripen after they are picked. The good news is that raspberries are one of the powerfoods, along with saskatoons and apples. Helps keep your metabolic rate high with high levels of the trace mineral manganese. One of the top 10 antioxidant-rich fruits and vegetables. Has twice the ORAC value (antioxidant) of oranges or apples and higher than blueberries. Contain ellagic acid, a natural substance which is an anti-carcinogenic (cancer-preventing). Has more fiber than most fruits. One cup of raspberries provides over 8 grams of dietary fiber. The seeds are rich in vitamin E, omega-3 fatty acids and have a natural SPF (sun protection factor) of 25 to 50. Naturally have no cholesterol and no sodium. One cup has only 64 calories with a low-glycemic index. Raspberry leaf tea is commonly used during pregnancy to combat the nausea of morning sickness. The sugars in raspberries are natural and healthy. Raspberries are very easy to grow. I started with one raspberry bush 11 years ago and now have a big raspberry patch! I picked over 8 buckets full this summer. In fact, I have been having buckets full for at least 7 years. Right now, I a eat a large bowl of raspberries (after I pick them) every morning for breakfast. Mmmmm. I just love being able to do that. What do I do with all those raspberries? Give some to neighbors and friends. And of course I eat lots of them while they are fresh and in season. 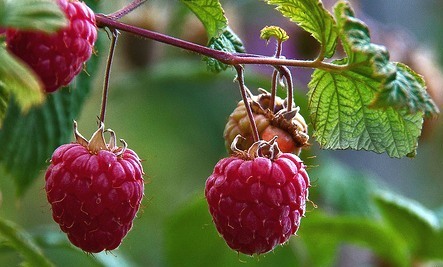 Some of us are not able to grow raspberry bushes~YUM ! The information in this blog is extremely useful for the people. all berries are great for your health,I enjoy cooking with them all.